Just in case you weren’t already aware of this, Apple is super duper serious about privacy. In a new Time opinion piece, Tim Cook reiterated the company’s old talking points about how other companies (read: Facebook and Google) turn people’s personal data into a product that they can sell, sometimes without the user knowing it’s even happening. But Apple will never do this. Apple is the good company, Cook seems to be saying, and by the way, would you like to buy an iPhone? Yes, at face value, it appears that Tim Cook is making the rare effort of publishing a bunch of words in an international publication to distract from Apple’s recent revenue woes. This is probably partially true, although Cook’s piece is part of Time’s Davos 2019 package, where everyone from Justin Trudeau to Jane Goodall contributed thoughts on global issues. But this privacy screed was an especially rare statement from the Apple CEO at a uniquely tortured time for his company. Apple is stumbling, and its future seems uncertain. 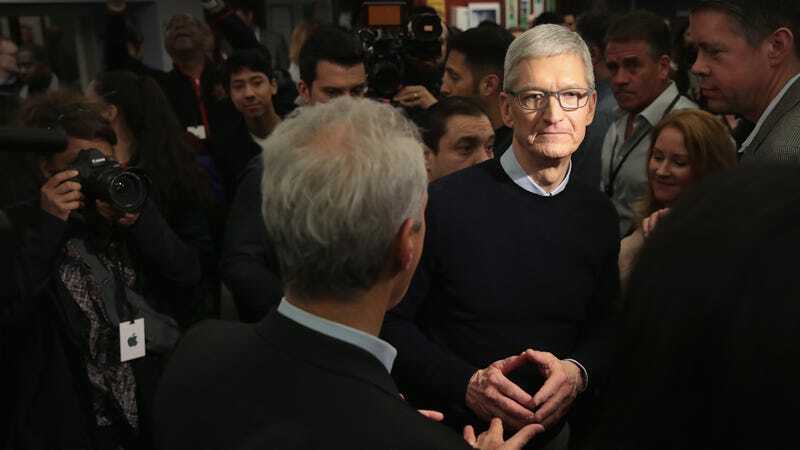 Tim Cook would like to change the conversation back to something that is near and dear to him but more importantly to all of you and your gadget-buying decisions: Privacy is paramount. Meaningful, comprehensive federal privacy legislation should not only aim to put consumers in control of their data, it should also shine a light on actors trafficking in your data behind the scenes. Wonder who those actors could be? On one hand, Cook is referring to the many obscure companies that buy and sell user data, often for online advertising purposes. On the other, he’s pointing at companies like Facebook and Google, which are deeply invested in the data business. The Facebook link is especially clear, because Cook goes on to argue that the Federal Trade Commission (FTC) “should establish a data-broker clearinghouse” that would police those in the business of personal data as well as empower users to see where their own data goes. Just days after these Christmas-time revelations about Facebook’s data abuse, Apple launched into its latest pro-privacy campaign. Apple even made a rare appearance at the Consumer Electronics Show (CES) in Las Vegas in the form of a skyscraper-sized ad reminding people that “What happens on your iPhone stays on your iPhone.” Of course, the billboard appeared just a few days after Tim Cook issued a panic-inducing warning to Apple investors that the company would be lowering its revenue estimates thanks to slowing iPhone sales and trouble in China. And now this Time op-ed is again reorienting the conversation to highlight Apple’s strengths and its competitors’ weaknesses. It’s all marketing. Apple is not your friend. It’s a company that sells computers and phones, albeit fewer and fewer of them lately. Apple is also a company that would like to sell you more services like iCloud, Apple Music, the App Store, and perhaps even some yet-to-be-announced streaming video service. Apple might also like to expand its presence in the advertising industry, which stands to be transformed by any future privacy legislation or increased FTC oversight. There’s a good chance that stricter oversight on data-sharing might just break online advertising as we know it. And Apple might be there to pick up the pieces. None of this is to say that Tim Cook’s views on privacy are wrong. He actually makes a lot of great points in his new op-ed, and his recommendations for how to improve online privacy sound pretty compelling. They’re especially compelling for Apple’s business interests, at a time when the company’s bottom line is suffering. Just keep that in mind if you’re wondering whether it’s a good idea for an Apple executive to tell the government what to do. Apple is a corporation that cares more about money than privacy. That’s just how capitalism works.